I have officially jumped on the Beautycounter train and I couldn’t be more thrilled! I have many reasons for deciding to make sharing the word on cleaner, safer skin care and beauty products part of my personal empire but the biggest one is my daughter Atti. I was what you would call an EARLY bloomer. My second grade teacher took photos of everyone in the class on the first and last days of school and looking at those pictures now, all I can think of is holy crap! At the age of seven, I went from skinny minny to real curves in the matter of one school year. I was the first little girl in my elementary school class to get her period at just over 10 years old. I’m not sure if you would call that precocious/early puberty or not, but I know it felt early for me. Endocrine disrupting chemicals are thought to be a large cause of precocious puberty and a whole host of other nasty things. There are thousands of these chemicals currently unregulated in the United States. I’m sorry but what?! What’s worse is that some of these chemicals are often used in things we put on our body EVERY DAY! Lotion, make up, skin care products, shampoo, etc. And many of these chemicals can be absorbed into your bloodstream. Gross! • The United States has not passed a major federal law regulating the cosmetics industry since 1938! • There are more than 80,000 chemicals on the market today. Many don’t have any safety data. This is particularly true of those used in the skin care and beauty industry. • Over the past two decades, the European Union has banned close to 1,400 chemicals in the product formulas of personal care products and restricted the levels of over 250 more in such products. The United States has only partially banned 30 to date. I’m here to be part of a change that will mean Atti doesn’t have to worry about if her skincare is safe. It will mean that mothers at every stage won’t have to worry if the products that help them feel comfortable in their skin are safe for them and their babes. Beautycounter is my outlet to fight that fight. Decades of studies indicate that serious health issues (including, but not limited to asthma, learning disabilities, cancer and infertility) are on the rise, and due in some part to our ongoing exposure to toxic chemicals—whether it’s in the shower, on our commute, while we eat lunch at a local restaurant, or when we clean our kitchens at home. What’s worse is the Food and Drug Administration (the agency that regulates cosmetics) allows companies to use chemicals known to be extremely harmful (lead, formaldehyde, and phthalates) in the products we put on our bodies and on our kids every single day, day after day. This is why I’ve partnered up with Beautycounter…. They rigorously screen all potential ingredients for safety and prohibit the use of 1,500+ questionable or harmful ingredients when formulating our products, which you can find on The Never List®. As a B-Corp, they balance profit, people, and planet when choosing their partners and ingredients. Beautycounter chooses only the best organic, natural, synthetic, and sustainable ingredients that meet their exacting standards. Not everything in this list is Beautycounter, but if you do purchase anything BC through the links on this page I will become your easily accessible, go to girl for all your questions, concerns, and new product alerts. I will also send oodles of gratitude your way. Most mornings I wash my face with nothing but water. A good number of splashes and some light but invigorating rubbing usually does the trick. On those mornings when I get a workout in or feel like I need a bit more I reach for my Charcoal Cleansing Bar. Next I will spritz or swipe with some sort of toner. My absolute favorite is this Colloidal Silver and Lavender spray from Hylunia but I also keep a classic witch hazel toner on hand and I recently added the No. 3 Balancing Facial Mist to my routine and I love it, especially on days I’m going to be wearing makeup. I follow that up by pressing a few drops of the No. 1 Brightening Oil into my face and neck. Then I pat on a layer of the Countermatch Adaptive Moisture Lotion and finish with the Countermatch Eye Rescue Cream. And sometimes that’s it. Since implementing such a nourishing skin routine, I don’t feel compelled to wear makeup most days. My skin is happy and healthy and makeup is a fun, extra self care ritual that I enjoy implementing when I feel called. It always starts with the Cleansing Balm. I can’t say enough wonderful things about this product. It is so nourishing, does an amazing job of removing makeup and can be so much more than a cleanser. It also lasts forever! I massage the balm into my face for a good minute - it’s always a welcome treat after a long day. Then I run a wash cloth under hot water and hold that up to my face to do a mini steam and wipe off the balm. I’ll repeat that 1-2 more times depending on how my skin feels. Next I tone with this Colloidal Silver and Lavender spray again. Most nights, a serum comes next. 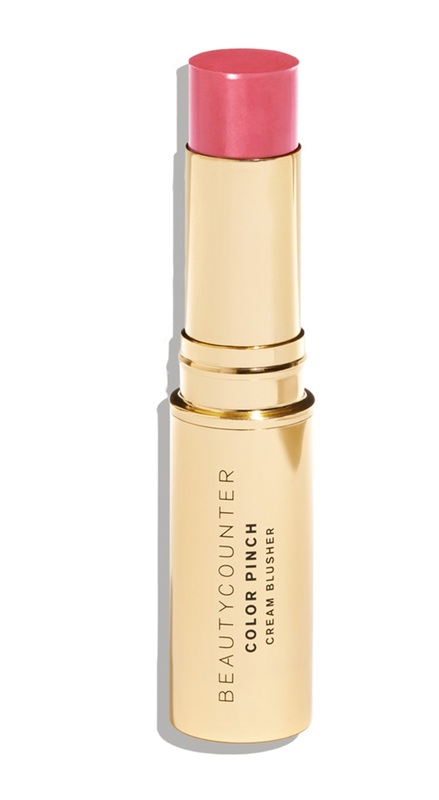 I’m a fan of the Countermatch Intense Moisture Serum or Rejuvenating Radiance Serum. About 3 nights a week though, I use the Overnight Resurfacing Peel instead of a serum. This is one of those magical unicorn products that has made a huge difference in the health and appearance of my skin. Become a Beautycounter customer and start swapping out your skin care and make up for safer, cleaner options. JOIN HERE and make sure that “Sarah Kurtanich” is listed as your consultant. I’ll be sure to offer great support! If you are passionate about this mission and are ready to spread the word about safer skin care and makeup, join as a consultant! You’ll save 25% off your own orders and have the opportunity to earn some additional income by educating others about the skin care industry and how to make safer choices. Some consultants earn a full time income, while others do it on the side to share their passions and supplement their regular income. It is very flexible and can be whatever you want it to be! We are a direct retail company (not an MLM), we do not require that you spend a minimum amount on products every month. We have a low start-up fee of $95 (which you will earn right back!). We offer tons of support on our team and we will coach you in how to educated others and run a successful business! Click this link and then click the menu option Join as a Consultant. Enter your email and other required info to create your account. When the option to select a Mentor comes up, make sure it says Sarah Kurtanich. Where and how we spend our money carries a lot of power. Choosing safer, cleaner products over those laden with untested and harmful chemicals is an easy way to help create change. There are many wonderful companies out there now creating these better options for us. I’ve used many of them and still use several that do not have an equivalent in Beautycounter’s options. I’m happy to share information on anything in my skin care arsenal including those products that aren’t Beautycounter. Yes, being able to offer extra financial support to my family is wonderful, but my real goal here is to help us all stop using products that are potentially hurting our health and our home.